In a world of chaos our Heavenly Father delivers order. God is order. Order is the opposite of chaos like love is the opposite of evil. In order to obtain a daily life without chaos one needs Wisdom! Through wisdom God gave order to overcome chaos. Seeking wisdom is the goal of man’s life and religious teachings. In doing so, one will have a life of prosperity because he has conformed to the order of creation, not chaos. Wisdom is the answer to defeating chaos and she is given to us by asking God for it! King Solomon, the son of David, king of Israel was known for his infinite wisdom. This wisdom is displayed in the book of Proverbs. The book of Proverbs is known as one of the Wisdom books of the bible. The book of Proverbs compiles numerous short instructions for living a prosperous life on earth. Instructing people in the path of wisdom is what Proverbs is all about. If you are tired of being foolish and doing foolish things and are unsure how to break free from a foolish life, read the book of Proverbs. Seeking wisdom from our Heavenly father is the key to breaking the chains of foolishness. The book of Proverbs can help you overcome the challenge and begin leading you in a life of wiser choices! 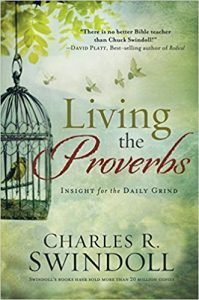 Charles Swindoll has a book that can guide one through the book of Proverbs. 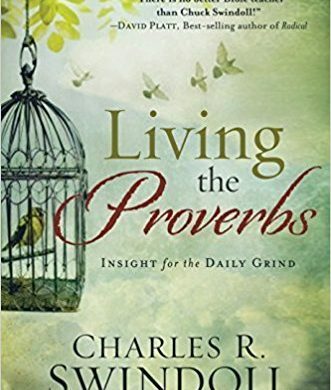 It’s titled “Living the Proverbs” and it is an excellent gift for father!